ACT Research Services of Iowa City, Iowa, recently released the ACT scores of the members of the Class of 2015 of Lakeside Lutheran High School. 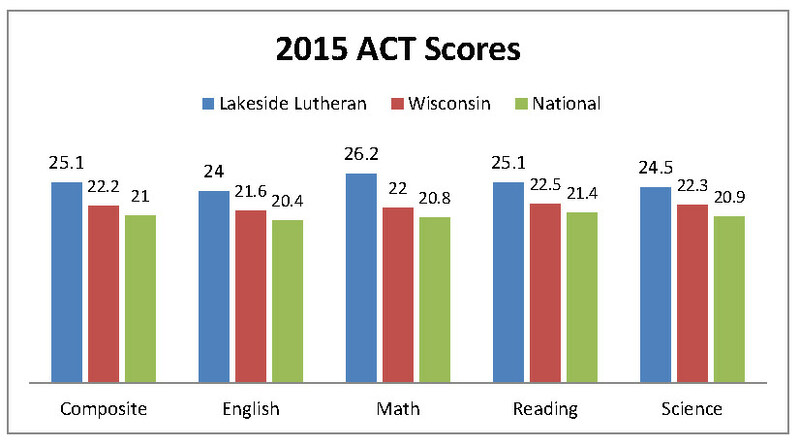 Seventy-three percent of 2015 Lakeside Lutheran graduates wrote the ACT in 2014, matching the state average. Based on a 36-point scale, the composite score of these students was 25.1, above the state composite of 22.2. Wisconsin as a state is the second highest ACT composite score average among states with over 50% of students testing, behind only Minnesota at 22.9. This composite score keeps Lakeside Lutheran results among the top 5% of nearly 460 public high schools in the state, as reported by the Wisconsin Department of Instruction. The most recent Lakeside Lutheran scores stayed the course and even raised the bar within its five-year average scores. Compared to the previous school year, scores in three core areas – math, reading and science – rose, with Math showing an almost 2-point score increase, from 24.3 to 26.2. 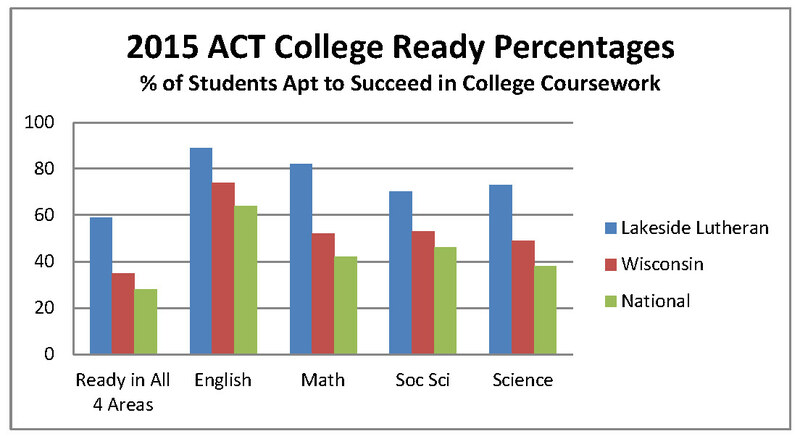 The ACT organization reports that “it is the rigor of coursework – rather than simply the number of core courses – that has the greatest impact on ACT performance and college readiness.” Fifty-nine percent of Lakeside Lutheran students who wrote the test met all four standards for college readiness as determined by ACT – in English Composition, Algebra, Social Science, and Biology— meeting ACT benchmarks within these areas indicates at least a 50 percent chance of earning a B or higher in first-year college courses and a 75 percent chance of scoring a C or higher. The 2014 Wisconsin average for meeting all four standards is 35%. According to ACT research, students who meet these benchmarks are more likely to succeed in college and earn a degree than those who don’t. The ACT is a national college admission and placement examination that is used by more colleges than any other examination. Begun in 1959, more than 1.8 million students wrote the ACT last school year, including over 46,000 students in Wisconsin. This year the ACT became a standard assessment for all 11th-graders in Wisconsin public high schools. Lakeside Lutheran High School in Lake Mills is a ministry operated by a federation of 31 Lutheran congregations who are affiliated with the Wisconsin Evangelical Lutheran Synod or the Evangelical Lutheran Synod. The school holds accreditation from the North Central Association Commission on Accreditation and School Improvement (NCA CASI), a division of AdvancED. For further information about Lakeside Lutheran, contact Principal James Grasby at (920) 648-2321.